Pastor Courtnell has been with Montgomery since 1999 and is currently the chairman of the board for FOCAS Ministries. His desire is, “to see the church grow and people’s lives get to the place God would have them to be to bring them to their full potential in the Lord”. He has a degree in theology and has worked in various positions since 1998 including elementary school teaching for three years, but has been active in full-time ministry since 1973. His extensive experience coupled with his manifold gifts in missions, evangelism, exhorting and encouraging, makes Pastor Courtnell an ideal associate pastor. 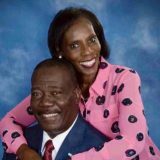 Pastor Courtnell has been married to his sweetheart, Ann Marie, since 1974 and has been blessed with four adult children and one grandchild. They are natives of Trinidad and Tobago, West Indies, but have lived in America since 1978. In his down time, Pastor Courtnell enjoys bowling and watching game shows.